The main sign in the parking area has been changed from the old construction sign. There is now a prominent marketing sign. 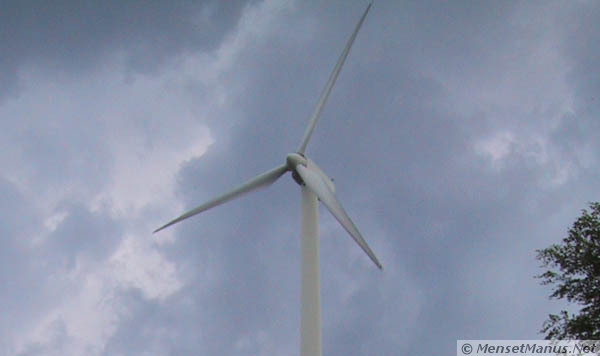 The turbine blades were showing signs of dirt buildup, which causes a reduction in performance. 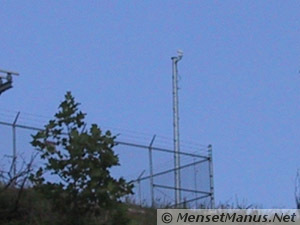 A surveillance camera (apparently for monitoring the turbines) has been installed. The verbatim text of the signs is shown immediately below, and my comments follow. The Buffalo Mountain Wind Park marks the first commercial use of wind power to generate electricity in the southeastern United States. 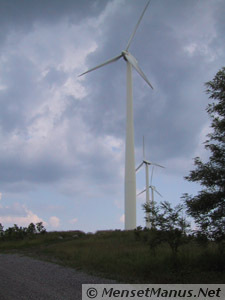 TVA erected three wind-powered generators on this two-acre site in the fall of 2000 at a cost of $3.4 million. The generators provide about 2 megawatts of capacity to the TVA power system and generate some 6 million kilowatt-hours of electricity a year-enough to serve more than 400 typical households in the Tennessee Valley. Electricity from the turbines is fed into the nearby Clinton Utilities Board power system that is connected to the TVA power grid. 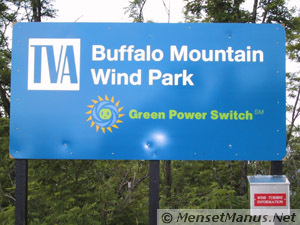 The wind-generated electricity is part of a clean energy option called Green Power Switch sold by distributors of TVA power. 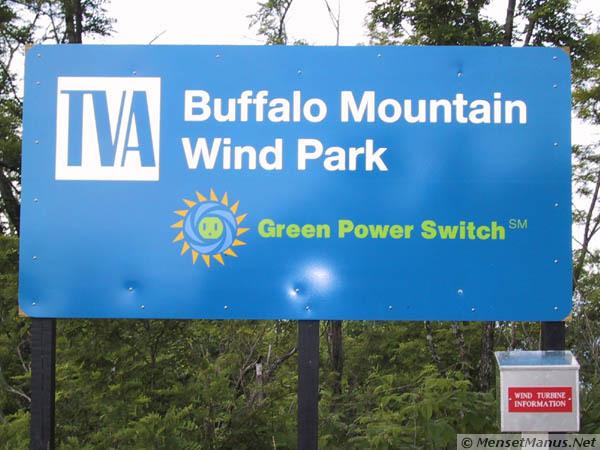 TVA initiated wind-power generation at the same time it added solar power photovoltaic systems and a landfill gas generation site-All part of Green Power Switch. 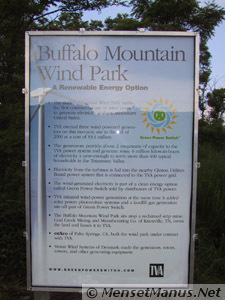 The Buffalo Mountain Wind Park sits atop a reclaimed strip mine. Coal Creek Mining and Manufacturing Co. of Knoxville, TN, owns the land and leases it to TVA. enXco of Palm Springs, CA, built the wind park under contract with TVA. Vestas Wind Systems of Denmark made the generators, rotors, towers, and other generating equipment. TVA calls the power plant site a "park." This is simply a marketing ploy to go along with the "green" power marketing strategy. This power plant is no more of a park than other electricity generating stations are parks. No picnic tables, park benches, ball fields or other park like attributes are seen. TVA says they expect to generate 6 million kilowatt-hours in a year. This is only about 34% of the rated capacity (i.e. 2 million watts for 365 days would be about 17.5 million kilowatt hours). It remains to be seen how they actually perform for an entire year; however, TVA previously announced total generation of about 2.1 million kilowatt-hours as of the end of June 2001. This works out to only about 19% of rated capacity, even assuming start of operations of November 1, 2000. Here is more recent performance data. The turbine blades were visibly dirty, particularly along the edges and tips. This is known to cause some reduction in performance. Click on the photo at left to zoom in. 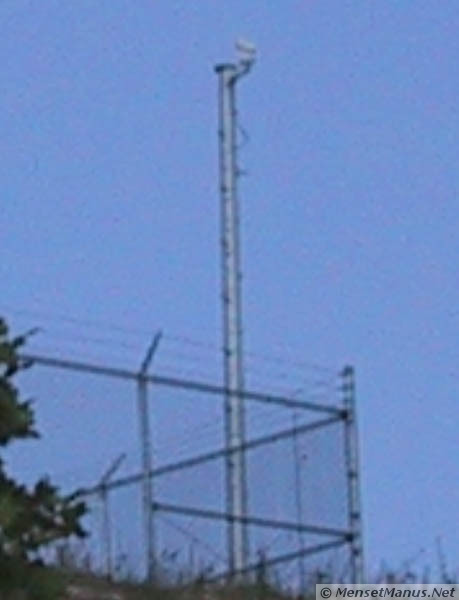 A video surveillance camera had been installed. Click the photo at right to zoom in. I last touched this page on Saturday, 2007-11-17 at 05:08:57 UTC.